Germany’s wackiest drum n’bass duo return here, creating a typically complex mixture that sounds a little like Kyuss jamming with Tool after having listened to a few Mr Bungle albums. Carefully controlled proggy chaos flows like a river, often almost freeform in an especially Jazzy style, equally often controlled and defined in a strangely King Crimson manner. It’s a big step forward from previous albums – the songwriting has taken shape and form, meaning that you can actually remember somewhat how the likes of Oceanriver go. As ever, the biggest stumbling block in appreciating this band are not what you’d expect – the usage of bass and drums is varied, inventive and always exciting. The vocals, however, are shouty, accented, and a little jarring if you’re new to the band, although those familiar with Stoner Rock in general should have no problems at all. For this is enjoyable stuff for the experimentally-minded. It’s a heady, hypnotic, druggy sort of music, technical structures barely hidden under clouds of smoke, moving from the melodic to the meandering with barely a pause inbetween. I’m still being surprised by this album, it never seeming quite to be the same on each listen. This is perhaps due to the weird Melvins-esque vibe I pick up, complex songwriting mashing painfully against that loud bass tone, A Poem even bringing bad Korn-shaped memories to mind... fear not, however, for Beehoover are anything but Nu-Metal. Deciding quite what they are could take me days; the simplest thing to say if you like the sound of everything said so far, is to try them out! Beehoover are ultimately the sort of band that speak to everyone differently, providing rocking material for one and an atmospheric proggy marathon for the next. The sober, acoustic reflection of Wild Geese Yell is a departure for the band from their otherwise purist sound, but it’s an interesting one that fits in well with the ensuing slow-motion minimalistic misery that is The Dragonfighter. 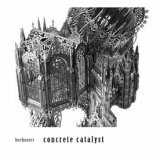 I think it’ll take another album for them to really show their true potential, as good as Concrete Catalyst is; there are little improvements that can be made to really make their music a knockout. As things currently stand, Beehoover make intriguing music for people in search of it, and do it damn well.